The year? Somewhere between the early thirties and the early fifties. Otto Griebling on the Cole Bros. Circus. 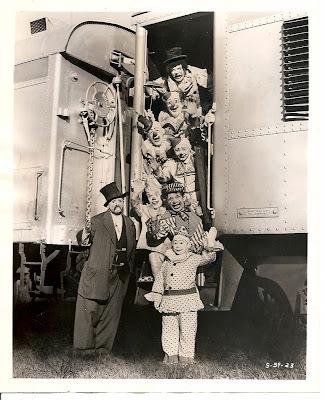 RINGLING TRAIN: Owen, Chuck, Freddie & Co.
Looks like we have Owen McQuade up top, my pal Chuck Burnes just below and I'm not sure of the next five below him but that's Freddie Freeman standing on terra firma and sporting his top hat at a rather jaunty angle. I'm guessing the "59" at the bottom sounds reasonable enough as a year for this, I believe that's the year that Ringling returned to the rails after two full seasons as a "truck show". An educational short produced in 1966 featuring an actor dressed sort of like Felix Adler narrates some footage of the Cole Bros. circus setting up the tents. 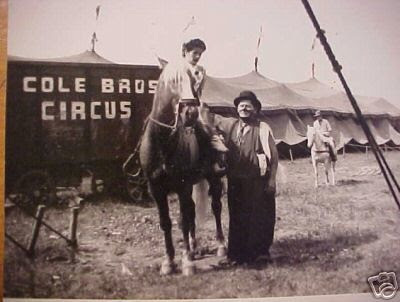 The film then abruptly changes to the midway of the Clyde Beatty Circus (this is not the "Clyde Beatty-Cole Bros. 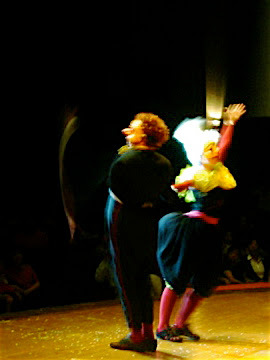 Circus, which toured from the late 50s through 2001 or so) and sometimes back again as the performance starts. 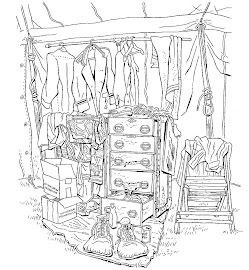 It's an interesting look at the old tent show days, with three rings presented under the big top, rain or shine. 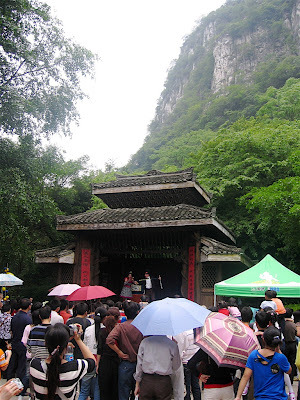 It's made more interesting for us by the fact that at about 14:00 you'll see a group of clowns outside the tent. Look carefully and you'll find Bobby Kay amongst them. At about 16:15 or so you'll see Bobby riding on an elephant in opening. At one point you'll see a tramp clown driving a float. This is not Otto Griebling and it is not Joe Jackson but he looks quite a bit like both. And at the end you'll see just how much Emmett Kelly had effected the popular conception of what a clown does. VALLEY COTTAGE -Peals of children's laughter echoed through the elementary school auditorium yesterday morning after a little old woman with a whoopee cushion let out a very rude noise. To the utter delight of students at Valley Cottage Elementary, members of the Big Apple Circus stopped by to give the children a taste of what's to come. 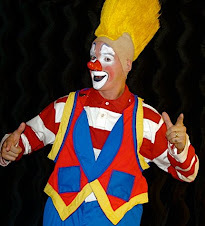 "Alright, ladies and gentleman," circus host Joel Jeske announced in a booming voice, "Grandma and the cushion of doom!" With that, the old lady laid down what looked like a very dusty handbag, rubbed her hands together, walked to one end of the stage and rushed back across only to very gingerly dive headfirst into the whoopee cushion. And although Grandma was old, the joke wasn't. The children burst into cheers and shrieks of excited laughter. "Give Grandma a round of applause!" Jeske shouted over them. 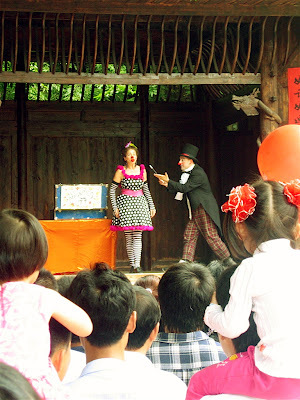 The youngsters also had an opportunity to ask the performers questions about the circus. They peppered them with questions like, "How do you talk without words in the circus?" "Is it hard to put your makeup on?" and "How do you balance things on your face?" To the last, Jeske used a juggling club to show how he learned to first balance it on his hand, then at the end of his index finger, his thumb and finally on his nose. And to really wow his young audience, he demonstrated the skill using a piano bench. 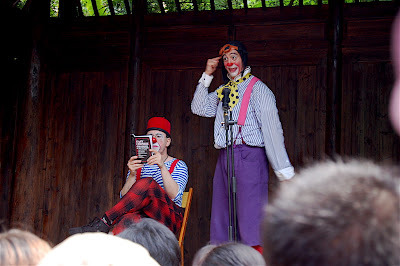 Jeske and Grandma, also known as Director of Clowning Barry Lubin, introduced themselves to the students yesterday and made a plug for the circus' show, "Step Right Up!" 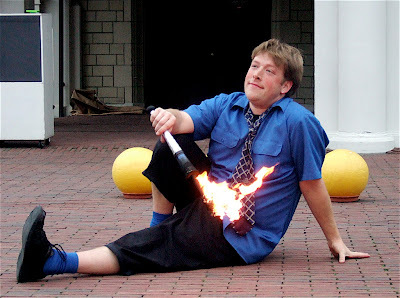 The performers, along with their acrobats and animals, will be at the Palisades Center in West Nyack from June 15 to 24. "We just want to let everybody know that our show is there and we'd love to see all these children show up and enjoy the show," Jeske said afterward. Principal Brenda Grier, who delighted in the performers as much as the children did, said the school's family resource center would provide tickets to students who cannot afford them. Tickets prices range from $15 to $38. 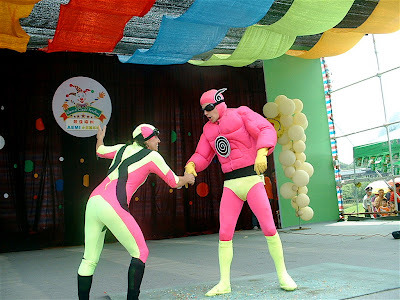 "This year they provided us with a nice promo," she said of the circus. "They are wonderful. Grandma always steals the show." 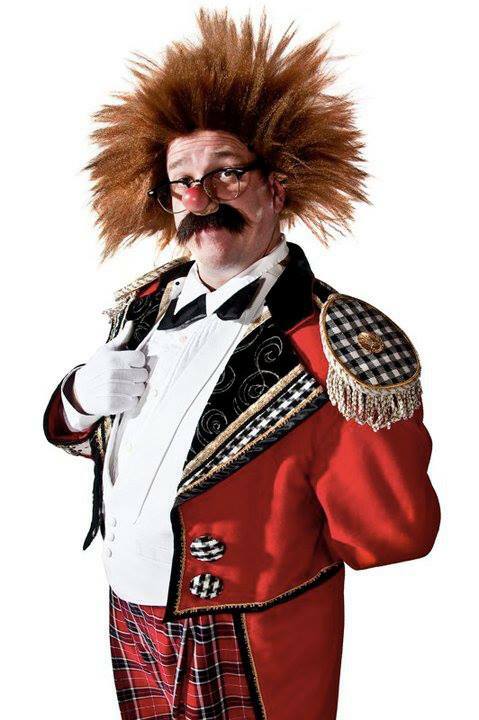 "If the Great Apple Circus was like a story, Grandma would be like the main character," he said. "She's really silly. Sometimes she's like my grandma." Find a video report on yesterday's circus visit at LoHud.com. Reach Christina Jeng at cjeng@lohud.com or 845-578-2497. Grandma was portrayed by Matthew Pauli at this special school show performance, not by Barry Lubin. Please click the title of this post to be taken to a video from the show. I'm in Orlando, Florida with the family this week and had the chance last night to take them to see Kirk Marsh's "FOOL HOUSE" at the Orlando Fringe Festival. 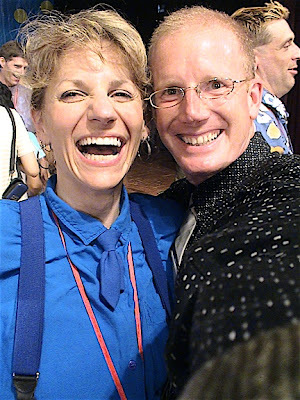 I first met Kirk in the summer of 1997 when we attended Ringling Bros. and Barnum & Bailey Clown College together. Now, 10 short years later, he just may be on the fast track to becoming this generation's answer to George Carl. And he's only about 28. I can't imagine what he'll be doing when he REALLY hits his stride! OK, here's a new use for the Orlando Sentinel. When an audience member lends you a credit card to break into your imaginary onstage house, you make the Sentinel into a paper airplane to sail the card back to its owner. Can you do that with a laptop? I think not, and there's lots of stuff onstage in Fool House that you can't do online. 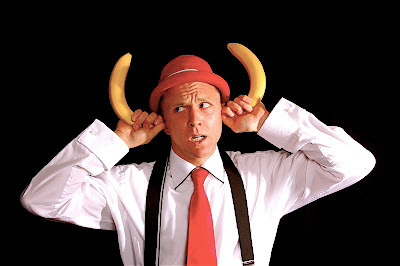 Catch a banana in your mouth, for instance, or put your little red hat on your head without using your hands. Best of all, he can charm an audience into watching something very low-tech, something very mild-mannered, for three quarters of an hour. Sometimes comic madness can be sweet. Remaining performances: 7:10 p.m. Tuesday 5/22, 11:15 p.m. Wednesday 5/23, 5:30 p.m. Friday 5/25, 8:25 p.m. Saturday 5/26, 1:10 p.m. Sunday 5/27. Brown venue. Please click the title of this post to be taken to Kirk's website. Emboldened after a day in Orlando at Disney with the family and a two hour phone call with Rik Gern about clowning I'm going to take yet another break from posting Liuzhou photos and instead post this historical photo of Ringling clown Felix Adler, often called "The White House Clown" for the number of times he was photographed with American Presidents and/or their families. Here is "Funny Felix" with "Sistie" and "Buzzie" Dall (don't you just love the "pet names" that the rich and powerful give to their offspring? ), the grandchildren of President and Mrs. Franklin Delano Roosevelt. They "enjoyed at day at the show" and are seen here with George Harmon (little person), Felix Adler and Peter Marold. I know. 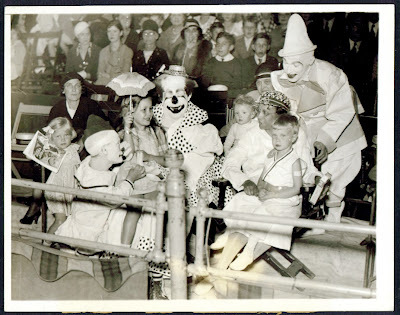 There are three children and a grown-up in this photo "with the clowns". "Is the woman in the photo a Roosevelt or a baby-sitter"? I don't know. "Which of these three children hasn't yet received an affluent nickname"? I'd suppose the youngest but I really don't know. 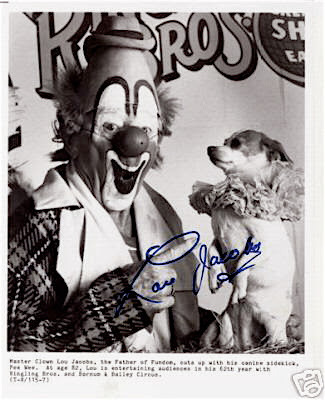 A photo that I found in an auction currently on eBay of Lou & Pee Wee, the dog Lou had after his longtime friend and comedy partner, Knucklehead. Click the title of this post to view the auction.